There are only a few things that make me remarkably excited, and one of those include out-of-town trips and hotel stays. I just love a nice getaway that provides a delightful bed and breakfast setup. To have the opportunity to dwell in a cozy and quality accommodation truly helps restore one's mind and body. So imagine yourself savoring all these and more at a redeveloped hotel that's resting on a hilltop, amidst a very tranquil and green setting. Want to know where to find such a place? 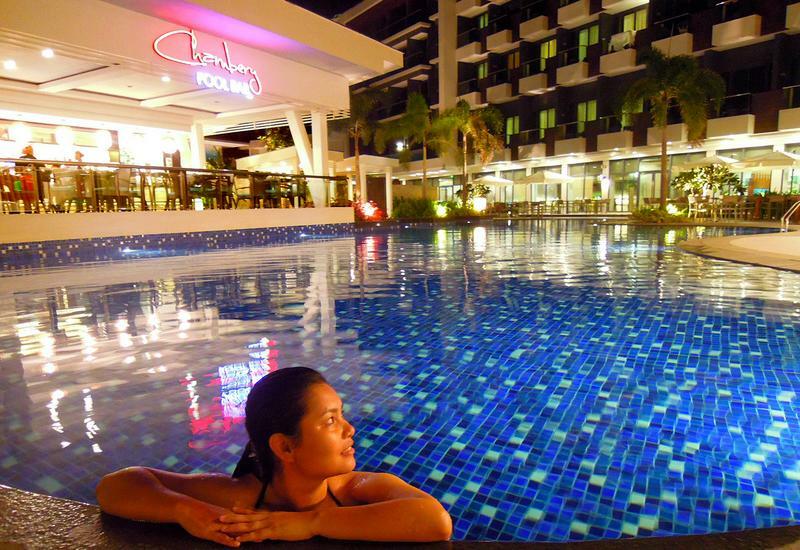 Visit the Oriental Bataan in Mariveles, and discover why it's a destination of its own. Real estate developer LKY Group is known for reviving old and vacated properties, and the Oriental Bataan (former Bataan Hilltop Hotel) is just one of the many treasured structures that they’ve brought back to life. A circular-shaped hotel that sits on top of a hill, the Oriental Bataan looks every bit elegant and contemporary. Just don't let its white exterior walls deceive you because you'll be surprised with what you'll find inside. The character of the place truly set the mood for me, as the earth tones and the Thai inspirations reflected at every corner of the establishment. The hotel, which has a large and open space, allowed itself to breathe, making both natural light and air to pass freely through its corridors. Given the hotel's uphill location in the Freeport Area of Bataan, guests are offered complimentary shuttle pick-ups and drop-offs from specific areas (eg. FAB gate, the jump-off point for the Five Fingers tour). 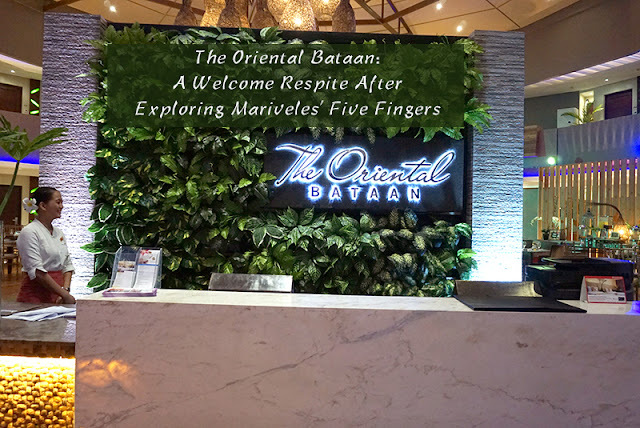 After going on a long day of touring the famous Five Fingers of Mariveles, the Oriental Bataan treated our group to a sumptuous dinner buffet at the Lobby Lounge - one of their in-house restaurants. While the food they served was something to rave about, the dining hall was also just as praiseworthy. The nature-inspired restaurant also has a uniquely molded chandelier that became an instant conversation piece during dinner. We asked one of the receptionists who the artists were, and were caught amazed after being informed that most of the artworks and accessories were (creatively) only created by their in-house staff. They've also incorporated the use of reclaimed wood and infused this into their design aesthetic, which was impressive because they left nothing to waste. The staff members followed a Thai-inspired theme that was apparent on the clothes they wore, especially in the way, they bowed their heads to greet their valued guests. Seeing them in action felt like I traveled back to Thailand. I appreciated the way we were welcomed, despite our late arrival, and how we were accommodated all throughout our stay. I also liked that the hotel crew on-duty that evening were game with our request of surprising three of our friends who were celebrating their birthdays. Some of the wait staff carried slices of their bestseller cakes from their restaurant, Cocoon, as they sang for our buddies. I loved the fact that they went above and beyond for us. So, on to a little food review, shall we? While the buffet setup was a pretty sight, the delightful assortment had our hungry tummies giggling with excitement. I was immediately drawn to the Asian and international cuisines that were arranged on the circular food counter. Now, I know that we were taught by our parents not to eat too much for dinner. But I just had to go for seconds given the sumptuous feast before me. I probably sampled almost everything on the table. My favorites included the Caesar salad, sushi, pasta, and barbecue. LET'S HAVE BREAKFAST, SHALL WE? I love waking up for breakfast. So imagine how excited I was to know that our morning spread was also buffet-style. While I ate heartily the night before, I made sure to sample just the basic staples like rice, egg, (choice of) meat, and coffee. I was surprised that a mini coffee vending machine, which looked off-theme, was placed beside the bread station. My first cup of coffee was filling until the machine could no longer dispense another serving. The machine, which was a plug-in, stopped producing a new batch, as soon as the hotel's power (suddenly) died. This was the time that I wished a fresh brew was prepared the traditional way. We ate one last time for lunch at Cocoon, the hotel’s main restaurant, before leaving the hotel. I was immediately caught swooning over its interiors, as it displayed a fusion of Thai and Filipino elements. I loved that the pots and pans that hung from the ceiling, which were reminiscent of traditional Filipino homes, were made as beautiful accent pieces. Of course, the food that they served in the restaurant was excellent too. Even the plating was notable. Each dish that was served to us like the Seafood Chopsuey and Singaporean Style Chicken were savory and appetizing. Plus, the Pad Thai tasted like an authentic Thai local cooked it. *Other dining areas include the Forest Grill and Liquid Bar. Most of our friends' rooms were offered a view of the pool, while ours was greeted with a sight of towering trees. Now, the best part about our room on the first floor is that we were only a few steps away from the Lobby Lounge. So when it was time to eat, we got to our tables right away. The Cellar Queen/Twin room, which I shared with two of my friends, was cozy and spacious. Our chamber was roomy enough that we were all provided separate beds to sleep in (a soft makeshift bed was added). The pillows were fine, and the blanket was soft. Our bedroom, which was enveloped with a warm white lighting, was a sight for sore eyes. I enjoyed looking at the wooden artwork that was placed on top of our bedside table, as it added more character and texture to the room. Now, as I was about to get under the covers, I immediately noticed a few dry stains on my bedsheet. I cringed at what I saw, but the housekeeping staff was apologetic and made sure I finally slept in clean beddings. While we enjoyed everything that our room offered, we, sadly, experienced a slight issue with the bathroom. We were given a room that was PWD-friendly. But we found the bathing conditions to be accident-prone (ironic, right?). We noticed that the water from the shower didn't drain as fast, so half of the floor area got easily flooded. To remedy the situation, we placed a make-shift mat (using the small towel provided) to help absorb the excess water. We also would’ve preferred a toilet with a bidet or a dipper, at least - two bathroom essentials that we wished were provided during our stay. TRIVIA: The hotel has four floors. The first two are located in the basement area and are identified as the third and fourth floors. Not that it wasn’t enticing, I wasn’t really in the mood to take a dip in the pool. But while I took photos of my friends who did plunge in its refreshing waters, I sat on the side and admired the uniquely shaped wall that surrounded it. It felt quite intimate to be somewhat enclosed in a concrete and arched cove that lets you look into the sky, as you swim your worries away. *Other facilities include The Spa, The Cliff Lounge, Fit and Tone (gym), and the Oriental Adventure Camp (for team building activities). The LKY group also offers the use of an events place called the Bataan Convention Center, which can hold about a thousand guests. They are also launching their very own dormitories (The Dormitory), which can accommodate big groups, for both short and long-staying guests. *Travel to Bataan in just an hour via 1Bataan Integrated Transport System - a ferry service that brings Manila closer to Bataan.